McCann out and Huws in? Things are hotting up as the new season approaches. The news comes in, but questions continue to pop up. Is Will Grigg really on his way to Scotland for a big transfer fee? Surely not. Will Latics be losing Emyr Huws as well as Chris McCann? Maybe. Why are Latics due to host Liverpool and Manchester United on consecutive days? Will the big clubs be sending their senior squads? Will it be largely youth players or maybe a mixture of the two? Or was it an offer the young chairman just could not refuse? A month ago we published an article Can Latics afford to keep Chris McCann? Our question has now been answered by the announcement that the Irishman has signed for MLS expansion team Atlanta United. However, it appears that McCann will go out on loan until January. After his good form last season there are Latics fans who are already clamouring for McCann to spend his loan at Wigan. There remain hopes among fans that Sharpe and Gary Caldwell will bring in Jordi Gomez and Leon Osman, but is it likely to happen? 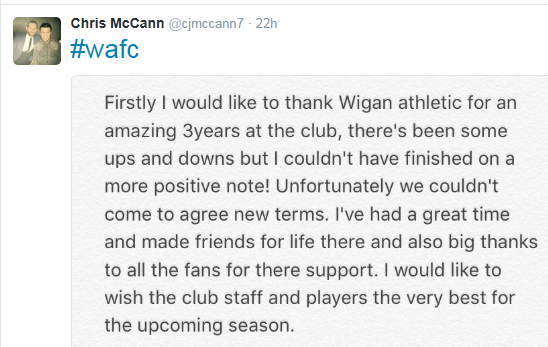 McCann announced his departure on the social media, giving due thanks to the fans. For most of us, McCann’s departure is no surprise. One can bet that Sharpe just was not willing to offer the kind of salary the Irishman wanted, likely have been around £15-20K per week. The departure of Reece Wabara was also most likely due to the club not meeting the player’s wage demands. Sharpe has set the tone on keeping a ceiling on the wage bill as Latics enter their final season of parachute payments. Most of the players who previously played for Latics in the Championship, receiving relatively generous salaries, have now left the club. However, some still remain and Sharpe and his recruitment team will once again look at getting as many as possible off the wage bill. Included in those are the three players sent off on loan last season – Emyr Huws, Billy Mckay and Andrew Taylor. Given that Caldwell already has Reece James and Stephen Warnock to compete for the left back position it is likely that Taylor will be seeking other pastures during the final year of his contract. Mckay did well to score 12 goals last season for a Dundee United team that finished bottom of the SPL. But he barely received a chance in his previous spell at Wigan and it appears unlikely that he will stay. The principal question mark hovers around the subject of Huws. The mere mention of Huws can invoke anger in Wigan Athletic supporters. In late August 2015 Caldwell talked about the player’s unwillingness to play in League 1. Caldwell’s comments certainly impacted upon fan opinion of the player. There remain some who would not like the player back at the club even if Caldwell decided on taking up that option. However, it can be argued that Latics did well out of sending Huws to Huddersfield. He gained further first team experience at Championship level, making 31 appearances and scoring five goals. The Yorkshire team paid his wages and the player’s value in the transfer market was maintained. There are arguments to suggest that Caldwell made the comments to avoid criticism that might have come his way by allowing the player to leave. Moreover that it was early in Caldwell’s days as Wigan manager and with more experience he might not have criticised a player publicly. The word ‘disrespectful’ can stir up emotions in football circles. However, even in that heated time last August the manager did not close the door on a possible return of the player in the future. However, rumours were circulating about a possible move for Huws to Fulham who might be willing to stump up a fee in the region of £2m for his transfer. The likelihood is that Latics will be losing two very capable midfield players in Huws and McCann. They will not be short in that area with Alex Gilbey having arrived from Colchester and Danny Whitehead from Macclesfield. However, neither has the experience at Championship level of Huws and McCann: they are clearly players for the future. If Latics can sell Huws for a price close to that they paid Manchester City a couple of years ago they will almost certainly do so. It would not only bring in revenue but they would be shedding another player on the level of the Championship salaries during the Rosler era. But questions remain over fans’ support for the player in the aftermath of Caldwell’s previous comments. Moreover statements made by the player during his time at Huddersfield hardly improved Wigan fan views of him. However, Huws has the potential to be a top player. He is tough in the tackle, with a high workrate, a great left foot, strong on taking set pieces. Together with the likes of Max Power he could form a formidable central midfield for Latics. If Caldwell really were willing to bury the hatchet with Emyr Huws would the majority of supporters get behind the player? He is still only 22 years old and represents one of the club’s most potentially valuable assets. Moreover with another full season under his belt, injuries notwithstanding, he would surely be in the shop window for the big clubs. Put simply, are Latics willing to take a gamble on Huws? Then how about Gomez and Osman? Just a quick note to express how much I appreciate the commentary and analysis on this site – thoughtful, well researched, and interesting. I get something out of every article. I, for one, think that supporters’ likelihood of accepting Huws back into the fold will largely depend on the players’ reaction to having him in the locker room. If the lads are willing to bury the hatchet on his apparent abandonment of their struggle in deference to his ample ability, the supporters should follow. But team chemistry is critical. During this team’s searing second half this past season, the players appeared to have developed genuine chemistry, enjoyed being around each other and celebrating each others’ achievements. In modern sport, the question of chemistry and form seem to have a chicken-and-egg causal relationship, but it’s clear they’re closely entwined. Taking the stance that team chemistry follows good form, Huws should be welcomed, whatever his past transgressions. Taking the stance that good form follows good chemistry, it may be wise to listen the council of the rest of the squad. If Caldwell is willing to bring him back, though, I have to guess that the rest of the team is, too. I’m going to cheer a Yanic or a Don Daniels whether they’re a hero or a goat. Conversely, I don’t have to love Huws to appreciate the fact that he’ll keep my team in the Championship while we ride out Sharpy’s previous salary commitments.